. : Farm Forest Line - Thinning - management of competition between trees :. Once established, individual plants on a site will both support and compete with each other. As the trees grow up together, what began as welcome shelter from the elements may very soon turn into competition for limited resources. The species composition, spatial arrangement and the impact of natural, accidental or managed interventions will determine how these interactions play out over time. Being able to manage the positive and negative interactions that occur between individual plants within a forest is possibly the most important aspect of silviculture. Competition can have both a positive and a negative effect on tree growth and wood quality. In young plantations a dense forest encourages rapid tree growth by suppressing weeds and providing mutual shelter from strong winds. However, as these trees continue to grow they begin to compete for light and moisture and slow each other's growth. Although tree stocking (stems/ha) is commonly used to describe the level of competition, it is limited because it does not take account of the size of the trees. A more useful measure of competition is the basal area. Basal area is the cross-sectional area of all tree stems at 1.3m height per hectare and is directly related to the volume of timber. An appreciation of how forest trees behave under varying degrees of competition can be drawn from trials where the same species has been planted at different stocking rates. 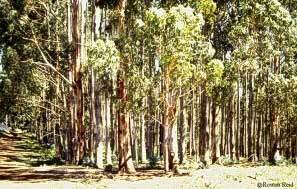 Inter-tree competition plays a powerful role in determining tree diameter and stand volume growth in plantations of eucalypt, poplar and pine. Similar relationships could be presented for many other tall forest species. From these example and others we are able to make some general comments about the effect of competition of tree growth. There is a great difference in the degree to which competition effects different species. Tolerant trees, such as the native and exotic pines, can form dense narrow canopies that allow forests to reach high levels of competition before individual tree growth is suppressed. Many of the hardwoods, including the eucalypts and teak, are much less tolerant. The lower shaded leaves of the eucalypts die as the competition increases, leaving only a small amount of canopy on each tree to sustain growth. The basal area in a young eucalypt plantation commonly increases rapidly until competition between the trees themselves slows diameter increments thereby limiting basal area growth. The basal area of eucalypt plantations in Australia appears to reach a natural limit of around 50m2/ha even on the best sites. On sites with medium to low rainfall, shallow soils or low fertility, the maximum basal area for a young eucalypt plantation may be closer to 20m2/ha. If left untended, any further growth in diameter in the dominant trees must be offset by the death of suppressed trees. By contrast, unthinned pine plantations grow slower in the early years but can achieve basal areas as high as 100m2/ha on high quality sites. Because pines are more tolerant of competition it is not unusual for them to yield twice the volume of timber at harvest than the native eucalypt forest they replaced. Another explanation for the low competition tolerance of eucalypts is the fact that they have naked leaf buds that are susceptible to damage during early growth. If the tree crowns rub against each other as they sway in the wind, the buds can be lost. This is why it is very uncommon to find the canopies of eucalypts interlocking in the way that is common in pines or cypress trees. Other native hardwoods, including the rainforest cabinet timbers, and the introduced deciduous species, such as the oaks, walnuts etc., vary in their tolerance to competition. Although some rainforest species are able to persist in low light environments, they may still need to be widely spaced to achieve rapid diameter growth.